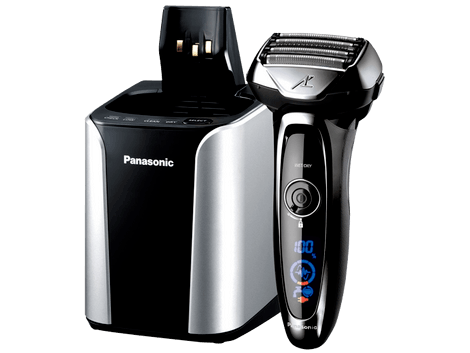 / Panasonic Arc5 vs Braun Series 9 – How Do These High End Shavers Line Compare? Panasonic Arc5 vs Braun Series 9 - How Do These High End Shavers Line Compare? If you’ve been searching for a new razor, you’ve likely already found some info on both the Panasonic Arc 5 and the Braun Series 9. They’re arguably the two most advanced and popular electric shaver product lines in the world. While they both have a lot to like, choosing between the two can be very confusing. Both product lines have several different electric shaver models. Some have subtle distinctions while others are significantly different. So comparing the two lines isn’t always very straight-forward. I spent a lot of time researching these product lines and their different shavers . Here’s a complete look at the differences and similarities between the two. The complete round-up of the Panasonic Arc 5 vs Braun Series 9 starts right now. Braun’s latest and most heavily advertised shavers line is the Series 9. This series replaced the Series 7, a formerly popular model with now out-dated technology, but nonetheless series 7 is still a great choice which won't disappoint you. Here’s where things get a little confusing. The Series 9 is further divided into two different generations: The original Series 9 and the updated Series 9. The original series had problems that were fixed in the updated series. 1. The 9095cc is wet/dry use and has an automatic cleaning station. 2. The 9090cc also has an automatic cleaning station but is dry use only. 3. The 9093s has no cleaning station and can be used either wet or dry. Updates are relatively minor. The models have a titanium-coated HyperLift & Cut Trimmer. These models are also available in silver. The updated Series 9 can be identified by the distinct gold foil. All the models in the updated series are wet/dry. The updated models are more durable over a long period of time. Occasionally, the shaving head on the original Series 9 models would break after extensive use. Otherwise, there’s really no significant difference between performance (although there can be a difference in price). Here's a table with the original and updated models. As usual, models with 'cc' include a cleaning station and models with 's' don't. This is Panasonic’s flagship shaver. The name refers to the arc-like shaving head design and the number of individual cutting elements. Like the Series 9, the Arc 5 is also divided into different generations. 2. ES-LV-95-S, which has an automatic cleaning station which uses detergent sachets. The 9N model has an automatic cleaning station while the 6N has no cleaning station. For markets outside of the U.S, the 9N becomes 9A and the 6N becomes 6A. This third generation has an improved texture on the thumb rest. The front-to-back tilt to the head is extended from 17 degrees to 20 degrees. A low battery alarm was also added. While the changes are useful, the basic shaving performance remains unchanged from generation one. Cordless shavers give you more freedom than corded ones. You can charge up the shaver and take it on a trip, keep it a desk drawer or generally bring it along wherever you go. Shaving time can be difficult to determine. Individual hair length and thickness will be a big factor. Most shavers can handle thick, tangled beards with ease. However, the Arc 5 has a faster and more powerful motor. At 14,000 CPMs, this is one of the fastest motors found in any shaver, well, ever. If speed is a major concern, you’ll want the Arc 5. Features are great but the most important aspect of any shaver is how your face looks and feels after you’ve finished shaving. In order to determine shave quality, I took a look at closeness, comfort and the wet/dry capabilities. When comparing rotary vs foil shavers, foil shavers generally provide the closest shaves. (not including safety razors of course). Both the Arc 5 and Braun Series 9 are no exception. You likely won’t be disappointed with either. However, if you’re looking for the absolute closest shave possible, I give the edge (no pun intended) to the Arc 5. Panasonic combines a few factors. The unique arc of the foils connects with the contours of your face. Plus, the Arc 5’s blades also have a relatively high 30-degree bevel to the blades. While the Arc 5 allows for a closer shave, I found the Braun Series 9 to be far more comfortable. Most of this is due to the head design as well as the unique grip. The foils on the Series 9 remain cool even after extended use. On the other hand, the Arc 5 foils can overheat. Shaving with a hot electric shaver can cause rashes, especially if you have sensitive skin. If you’re prone to blemishes and skin rashes or have a sensitive skin, the Series 9 is probably the better choice. It’s also a good choice if you have a thicker, heavier beard which results in longer than normal shaving sessions. Wet shaving is often more comfortable while being able to shave dry skin is more convenient. Most people prefer a shaver which can be used on both wet and dry skin. All of the shavers in the Arc 5 line are both wet/dry. Most of the Series 9 shavers are also wet/dry, with the exception of the 9090cc. Basically, if you want a wet/dry Series 9, you’ll want one of the new models. However, the situation becomes a little more limited if you want to use shaving creams or gels. All of the Arc 5 models let you use whatever shaving cream or gel you like. You can then easily clean the shaver by popping it into the cleaning station. The Series 9 is different. While you can use the wet/dry Braun models in the shower, you can’t use them with shaving cream. In a rather bizarre design move, shaving cream will clog and damage the cleaning station. If you want a Series 9 shaver which works with shaving cream, you’ll need either the 9093s or 9293s models. Neither of them has a cleaning station. Of course, if you’re willing to manually clean the shaver than any Series 9 can be used with shaving cream. If you want the closest shave possible, go with the Arc 5. However, the Series 9 shavers are generally a better choice if you have sensitive skin because the foils remain cool to the touch. If you prefer shaving with creams or gels, the Series 9 shavers require a lot more maintenance. With the Arc 5, you can use shaving creams and gels with very little fuss. Simply put the shaver into the automatic cleaner and you’ll be good to go. If you’re interested in dry shaving with a minimum of skin irritation, go for the Series 9. A model with a cleaning station is probably a good choice. But if you want the fastest, most powerful shaver I’d recommend the Arc 5. 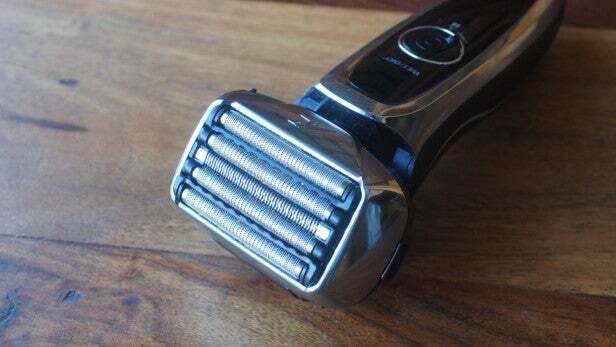 Shaving quality will be strongly influenced by the design of the shaver. I compared the build and design of both the Arc 5 and the Series 9. No real problems with either one here. Both shavers are built to last. Historically, Braun is an innovator regarding shaver design. But today Panasonic has certainly caught up in terms of quality. The Braun Series 9 is primarily made from plastic with a chrome, silver or glossy black finish. While the shaver will remain functional over the years, the appearance of the plastic will likely fade over time. This is especially true is the shaver is often wet. Also, the Braun Series 9 will show fingerprints fairly easily. The one exception here is the 9290cc which has a silver matte finish. If you want your shaver to always look brand new, avoid the glossy finish. The early generations of the Arc 5 have a plastic body similar to the Braun Series 9. However, the most recent version of the Arc 5 is made from metal. This makes the shaver stronger, more durable and definitely better looking than the Series 9. The two shavers have very different heads. The first thing you’ll likely notice is the size. The Arc 5 has one of the largest heads I’ve ever seen on a shaver. While this large head does cover a lot of area quickly, it’ll likely take some getting used to. The Series 9 has a more traditional shaving head. With four cutting elements, the head is smaller and more maneuverable. I prefer the head on the Arc 5. It’s the only one of the two which can be depressed, making it easy for shaving the jawline. Plus, the latest generation of the Arc 5 has gold rollers which are quite visually impressive. Both are quite easy to hold with textured rubber materials. If you’re only interested in dry shaving, the grip doesn’t really matter. But if you’ll be using the shaver in the shower with shaving cream, the Arc 5 is probably the best choice. Overall, I’d call this one a draw. Both shavers are comfortable to hold and easy to maneuver. While design is a matter of personal preference, I suspect most people will agree when I say there’s really no contest here. The Arc 5 is clearly the better-looking device. With metal construction and gold foil, the Arc 5 looks far more sophisticated and classy than the Series 9. There’s nothing wrong with the Series 9, but it just doesn’t have any pizazz. However, the Series 9 with the silver matte is certainly the best looking among the generations. Need to do some grooming or touch-up to the hair on your head? Both the Arc 5 and the Series 9 have long hair trimmers. The Arc 5 trimmer is located behind and perpendicular to the shaving head. This is where the large head is actually a disadvantage. It gets in the way of the trimmer. For the best access you’ll have to remove the shaving head and blades. The Series 9 trimmer slides forward. Although it doesn’t go beyond the shaving head, it’s far easier to access. On the other hand, the trimmer on the Arc 5 is clearly stronger and faster. If you need an occasional trim, the Arc 5 will work. But if you frequently need to use the hair trimmer, the one on the Series 9 is far easier to access and use. Most of the points here go to the Arc 5. The head is more powerful. The design is sleeker. The overall construction is sturdier. While the Series 9 has a better trimmer and is a bit easier to maneuver, the best build and design belongs to the Arc 5. Your shaver will need to be cleaned regularly. Fortunately, both models have options for automatic cleaning. Braun has been at the forefront of shaving technology for a long time now Their original cleaning stations were far superior to the older Panasonic models. If you’re buying the first generation of either, I feel confident in saying Braun will have better cleaning options. However, Panasonic has really stepped up their cleaning station game in the last few years. Today, both of the latest generations of the Arc 5 and Braun have excellent cleaning stations. The newest Panasonic models are different. They currently use sachets of detergent. These sachets can simply be added right to the cleaning station. Braun has cleaning cartridges which need to be dissolved in water before they can be used. The Arc 5 sachets will save you money in the long run. They’re cheaper and last longer than cartridges. Panasonic models are also the only ones with Sonic Mode. This is a special vibration mode which removes dirt and debris. Activating Sonic Mode is as simple as holding the power button for two seconds. With routine cleaning and care, you probably won’t run into any need for replacement parts. However, if you do need to make repairs, the Arc 5 will likely be cheaper. The Braun Series 9 shavers are constructed with a cassette. This means the blades and foils are all made into one piece of hardware. If anything goes wrong with an individual component, you’ll need to replace the entire cassette. In general it's recommended to replace the head every 18 months. It will cost you around 50$. The Arc 5’s blades and foils are able to be separated. You can replace individual parts easier. Also, this makes the Arc 5 easier to clean, too. A set of blades and foils will cost you around 50$ as well. First, you’ll have to decide if an automatic cleaner is worth the expense. If it is, you’ll probably find the Arc 5 to be the better choice. Operating the cleaning station is cheaper and easier than using the ones found in the Series 9 line. If you do choose the Arc 5, be sure and buy either a generation two or three. Those two generations have the updated cleaning station. Both shavers have a lot to like. There’s no clear winner for every person. Instead, you’ll want to select a shaver based on your individual needs. Each shaver is versatile, dependable and powerful. However, for the average consumer I’m more likely to recommend the Panasonic Arc 5. The Arc 5 is the more powerful shaver. Plus, the all-metal construction both looks great and will last a long time. With a powerful motor and a larger head, shaving with the Arc 5 is a breeze. The main reason you might prefer the Braun Series 9 is if you have sensitive skin. The cooler foil on the Series 9 helps prevent itchiness and breakouts. Regardless of which shaver you choose, your face is sure to thank you. These are two top-of-the-line shavers with a lot to offer. Here’s to your new smooth, clean shave!